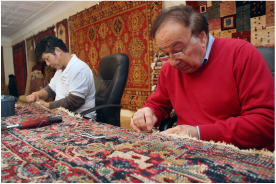 Oriental rugs are designed to pull all of the design elements in a room together, creating warmth and flow, but the selection process can be complicated – you must take into account room size, wall colors, and budget. An in-home consultation allows David Mouradian to feel your space before making recommendations and bringing selections that will compliment your taste. Customers are encouraged to live with a rug before making a purchase – giving them time to view the rug's colors and design in the changing light of day and with a variety of furniture arrangements. Color is often a personal choice, although design trends often drive decisions. An important factor when selecting colors is to think about contrast. What color are the walls? A darker rug may give a room painted in light colors strong contrast while a light rug surrounded by dark walls can be more appealing. While designing a room around a rug is often the easiest route, if you already have your furniture, our in home consultation will help you to decide how to select a rug with complementary or contrasting colors to make the room look interesting. 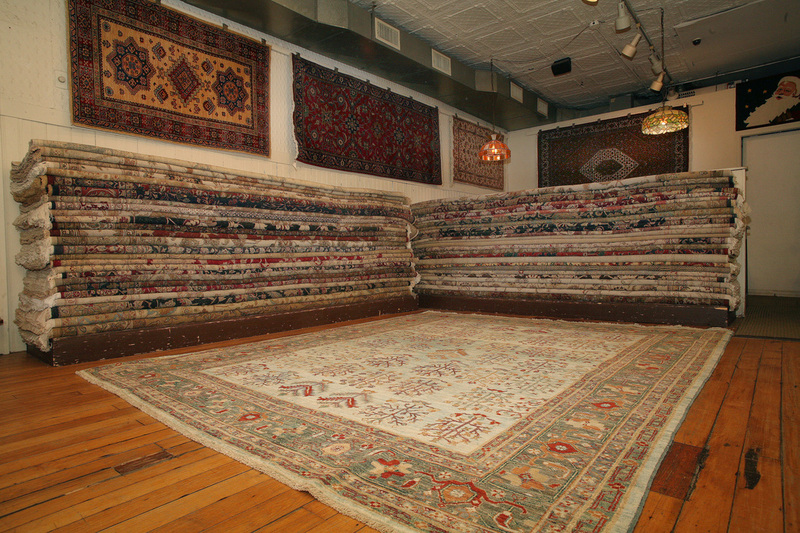 Bedrooms – To be aesthetically correct most bedrooms require 3 rugs to place around the bed – When Oriental rugs were originally made, they were designed to provide beauty through their designs and colors – you can't enjoy the designs if a rug is placed under the bed. 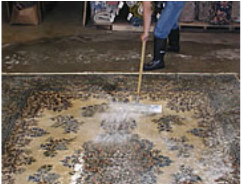 Kitchens – With hardwood floors, now so popular, an Oriental rug is a natural choice. A 3x5 rug in front of the sink offers beauty and protection of the floors. An 8 foot round or square rug is often the best choice for under a kitchen table depending on its size. Dining Room – The size of your table will be the biggest factor in determining the right size rug for a dining room. 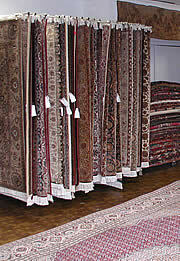 8x10 or 9x12 rugs are typical in dining areas – it often helps to try both sizes before making a final decision. While seating arrangements in dining rooms may expand for holidays – it's best to select a rug size based on every day use. Family Room – The biggest room can often present the biggest challenge. A large family room may have two focal points and two seating areas – thus requiring two rugs. A 9x12 or 10x14 will often give a family room adequate coverage. In a very large family room, two complementary rugs may be required. Office – Because computer desks are often placed against a wall, it's necessary to have a rug sized large enough to encompass the area that both the desk and chair are placed on. 8x8 or 8x10 rugs typically meet the needs of office space. If a desk is placed in the center of a room, a 6x9 or 4x6 centered in front of it will often create a warm environment.